This is the little girl that we managed to get a “breeder”, to surrender. We were trying to get her other birds but she would not let them go. The conditions were some of the worst I have seen. 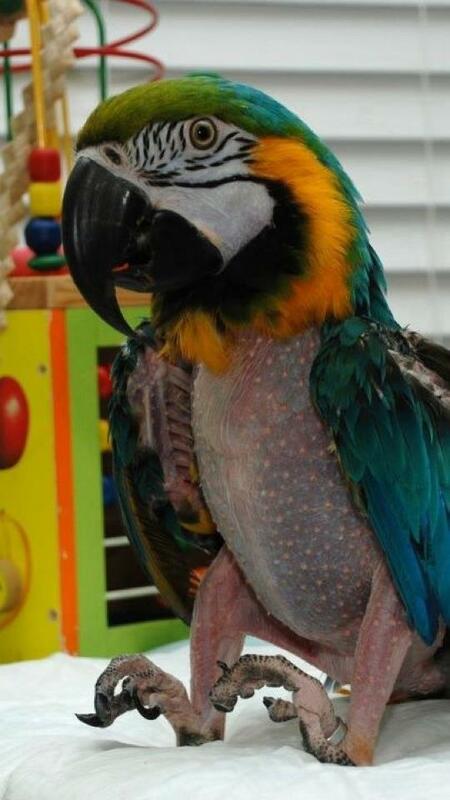 This Macaw, named “Baby”, was hatched in 96′. She was never given perches so she hung on the side of her rabbit wire cage. Our vet said that because of this the tendons to her feet slipped pulling her feet up. Since she received no medical care the bones of her feet and legs fused. She now has to walk on her hocks and her feet are useless. She can not climb or perch. This story was shared by a friend Kail Marie, I promise to do more research and share as I update. Baby’s story will not be forgotten! Gently massage the feet.. do not give up. Use non greasy lotions.. like maybe the cream they use for burn victims .. I am so upset I cannot think straight. Is she in a home or is she looking for one? What a sweet baby… I have a double yelow-head Amazon that her “bird” parents damaged her feet and wings to where she can’t fly/and has some issues with perching…. I agree, I have done this with wildlife birds and it does help some. You may at least get her to have some perching ability! Gloria, Email Melissa Shelton. with some therapy and essential oils we will get those feet working again… at least to some extent. Patti – I will love to give you a protocol! There is much to be done, most in the way of supplements. Also oils and physical therapy. Animal Scents Ointment (super light amount) – with Release especially. But, I’ll give you a huge run down later 🙂 Never, ever give up! Deb would who ever be receptive to trying essential oils – holistic care on Baby’s feet? The burn cream is called silvadine, by prescription only. But i bet someone you know has some in their frdge. I know I keep it onhand. Do some Passive range of motion, toe extention and ankle rotation. Is breaking and resetting her feet an option? She’s been through a lot I know. but if she’s a good canidate for surgery how happy perching would be for her. Now, I’m ready to go put the breedr in a chicken wire cage. Who’s going with me?